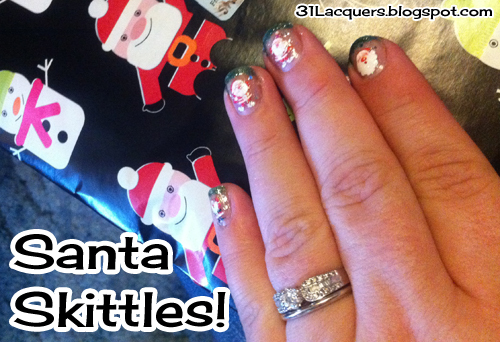 31 Lacquers: Holiday Nails: Santa Skittles! Isn't it interesting how nail art ideas can change from what you envision to what ends up on your fingertips? I knew I wanted to use some nail art stickers I bought from an eBay seller (here's the auction listing with close-up images of the stickers I received), but I wasn't sure what to do. 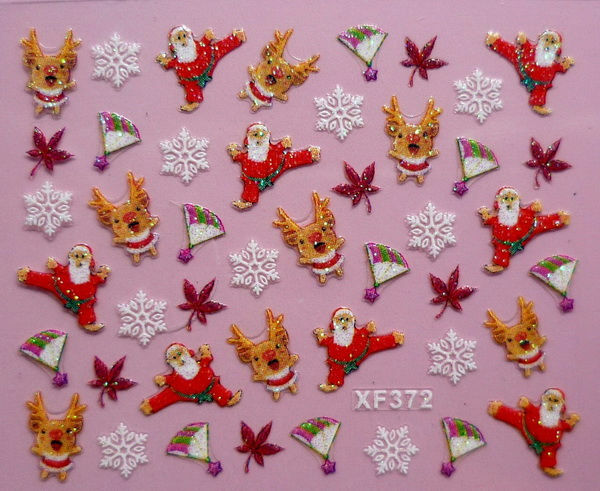 The nail art stickers I ordered included some extremely random Christmas designs, such as Santa in an airplane and Santa doing kung-fu. Seriously. However, when I sat down to paint my nails Christmas morning, I realized I didn't have a lot of time to spend on a manicure, so instead of painting them green and then using the stickers, I applied a quick basecoat and then chose 10 different Santa designs. I placed a different Santa on each of my nails, then used China Glaze "Mistletoe Kisses" to draw a very narrow French tip. I added some glitter from L.A. Colors Color Craze "Sparkling Diamonds" (BCC 555), and finally another clear coat. BAM! Holiday nails in an instant! 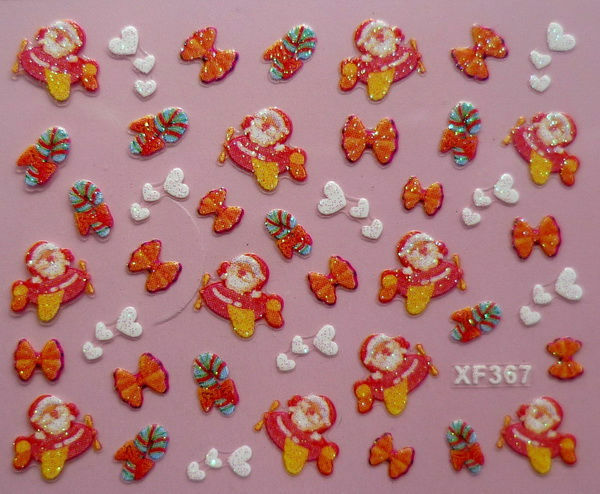 Here are the 10 Santas I used from the package of 24 different nail art sticker sheets from that eBay auction. I copied and pasted the individual designs from the images of the sticker sheets on my auction listing, but you can see all the stickers on eBay. These Santas are about twice as big as the stickers on my nails. 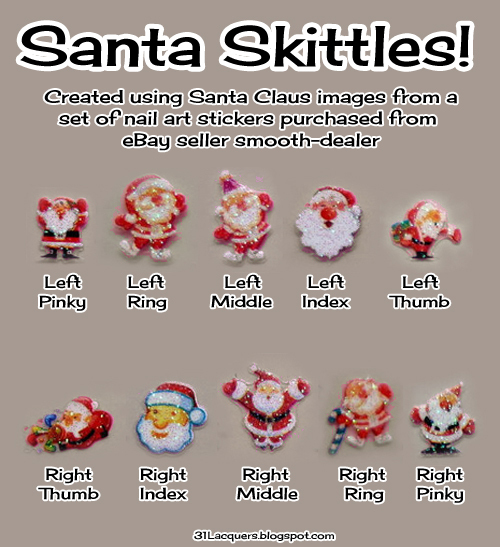 None of the nail art sticker sheets had 10 of the same Santa design, so that's why I ended up with Santa Skittles. Anyway, this was the cheapest auction of Christmas stickers I could find when I placed my order around Thanksgiving; however, the international mail from Hong Kong was slower than normal. I've bought things from ebay sellers from HK before, so I expected it to take about two weeks for my package to arrive, but this auction didn't show up until almost a month later. I barely got these in time for Christmas. Luckily, these sticker sheets include a lot of snowmen and snowflake designs, as well as bows and other doodads, so I'm sure I'll be using these again throughout the winter. 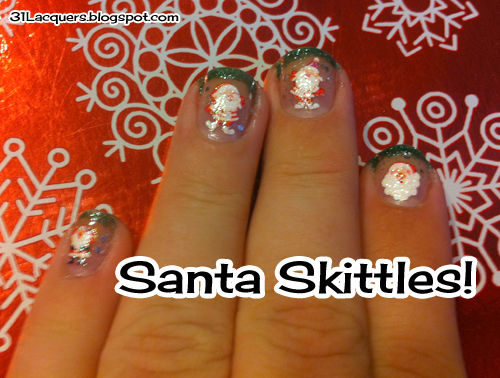 What did you do for your Christmas nail art this year? Did you wear a solid color or draw a fancy nail art design? Or did you cheat like me and go for stickers?